Citing sources familiar with Apple's "Project Titan," The New York Times reports the company will partner with an established automaker on a self-driving shuttle testbed. Apple is to supply autonomous driving technology, while the car maker provides a commercial vehicle fleet. Dubbed PAIL, an acronym for Palo Alto to Infinite Loop, the pilot program will carry Apple employees from one Silicon Valley office to another. Exactly when the driverless shuttles will hit the road is unknown, though such vehicles would be a welcome addition to the soon-to-open Apple Park in Cupertino, Calif. Beyond PAIL, the report includes a few interesting details about "Titan," which for all intents and purposes has been put on ice. Apple started work on its self-driving car initiative in 2014, with rumors of the effort leaking out in early 2015. AppleInsider was first to detail key aspects of the initiative being carried out in secret offices in and around Cupertino. At one point, Apple had well over 1,000 employees tasked to the project, ranging from automotive hardware to software. According to today's report, the company was looking to build a car from scratch, much like it did with iPhone. The effort included motorized car doors and a complete rethinking of what a car's interior should include — and not include. For example, the team investigated designs that lacked basic control equipment like a steering wheel or gas pedals. Other ideas involved a globe-like steering wheel that afforded better lateral movement than traditional designs. AppleInsider sources said Apple's ambitious undertaking hit roadblocks in late 2015. The Times corroborates the internal discord, saying things began to unravel as disagreements between team leaders like former project lead Steve Zadesky and top executives took root. In particular, one contingent wanted to build a semi-autonomous car in the same vein as Tesla's Autopilot-equipped vehicles, while another camp, led by CDO Jony Ive, pushed for a fully autonomous platform. The car's operating system, which according to The Times was dubbed "CarOS," was another bone of contention. Some sought to build the software off Apple's Swift programming language, while others wanted to employ C++. After longtime exec Bob Mansfield assumed control of "Titan" last year, the team was whittled down to necessary personnel as the project refocused on software and supporting solutions. Apple is now rebuilding the group, but with a renewed emphasis on specialists in autonomous systems, not car production, today's report said. 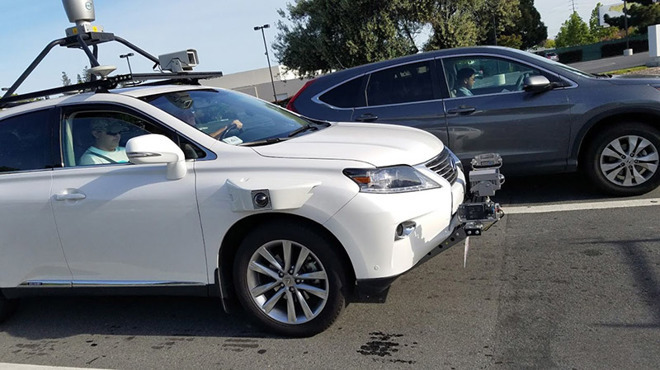 Most recently, Apple obtained a self-driving car permit from the California Department of Motor Vehicles and commenced testing of its autonomous technology using a small fleet of Lexus RX450h SUVs.